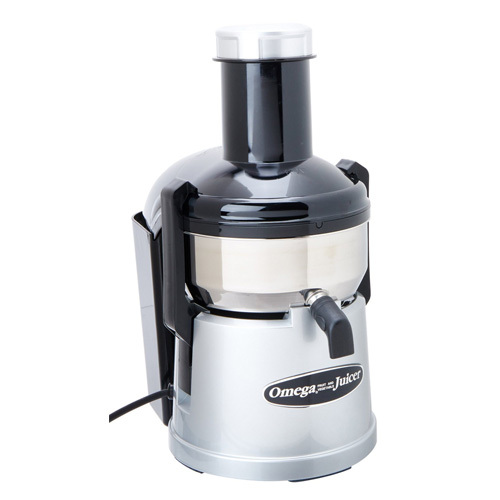 With a compact and stylish chrome and black design, the Omega BMJ330 comes equipped with a commercial grade 1/2 HP induction motor and lightning fast 12000 RPM centrifugal juicing process. It’s able to blast through an entire family’s worth of juice in just seconds. Complete with an automatic pulp ejection system and wide-mouth feeder tube, the Omega BMJ330 allows for continuous juicing operation. The compact design means this Omega Juicer is portable enough to take anywhere, while the rugged components are designed for easy and quick clean-up. Omega is one of the leading names in juicing technology, and the Omega BMJ330 Commercial model with automatic pulp ejection makes juicing ultra fast and fun. Simply press the button and the commercial grade 1/2 HP 350 Watt induction motor instantly ramps up to an astonishing 12000 RPM. This makes short work of even the toughest fruits and vegetables. With a rugged stainless steel cutter and large pulp collector, this juicer is perfect for continuously juicing large volumes of fruits and vegetables. The separate pulp collector can be emptied during operation, meaning you’ll never have to slow down when juicing with the Omega BMJ330 Commercial. Few juicers are as simple and easy to use as the Omega BMJ330. Simple assemble the basket and cover, secure the side straps, press the button and the machine does all the rest. Simple but rugged components make it very easy to disassemble and clean the Omega BMJ330 with ease. The ultra high-speed 12000 RPM centrifugal action powers through even the toughest vegetables, resulting in very high-quality pure juice. Few machines are as powerful and rugged as the Omega BMJ330. It comes equipped with an automatic pulp extractor and commercial grade 350 Watt motor for long-lasting durability and efficient juicing. While not the quietest juicer on the market, the lightning fast 12000 RPM extraction process makes short work of juicing. It’s easily able to quickly blast through an entire basket of fruits and vegetables, resulting in minimal noise duration. The stainless steel cutter and ultra high-speed extraction process of the Omega BMJ330 results in some of the highest yields available for a commercial grade centrifugal juicer. The main juicing unit, one stainless steel blade, juicing basket, cover with included feed tube, and instruction manual. Few other commercial juicers on the market can top the Omega BMJ330. Equipped with a powerful commercial grade motor, it allows it to spin up to a lightning-fast 12000 RPM. It rips through an entire basket of fruits and vegetables in no time flat. The compact design and stylish black and chrome housing makes this one juicer that you’ll be happy to display on your countertop, or bring over to a friend’s house for quick and fast juicing demonstrations. The unique large-capacity pulp collector can be emptied while the unit is running. This makes the Omega BMJ330 able to continuously juice large volumes of fruits and vegetables. With its simple yet efficient design, clean-up is a breeze. Not only that, the huge feeder tube is easily able to handle whole apples, pears, and large vegetables. The high-speed centrifugal extraction operation of the Omega BMJ330 makes juicing quick and economical, saving you and your family time and money while producing beautiful, delicious juice.